At the right time of year, the warm breezes and tropical waters of the Lhaviyani Atoll combine to turn Kuredu into a kitesurf paradise. 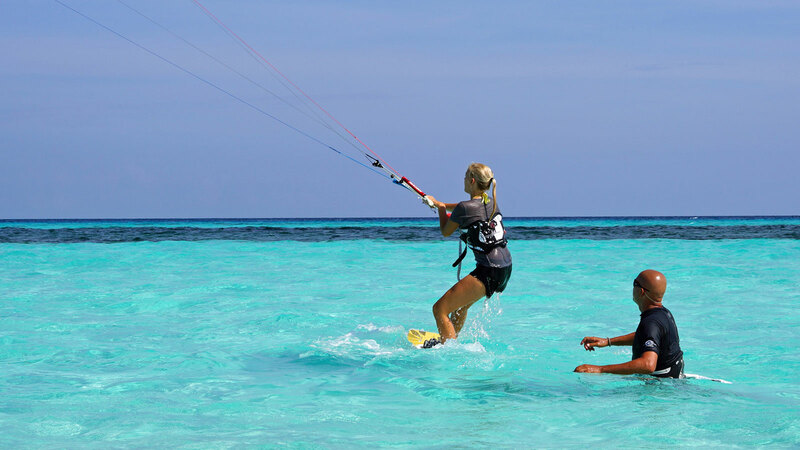 Our brilliant location in the Maldives offers shallow, warm waters that are ideal for guest who wish to learn kitesurfing. Periods between November through to January, and June to July, offer the best conditions as the seasonal winds pick up enough to entice the kiters out onto the water. Guests visiting at this time are often treated to a magnificent show of kites dancing through the air as surfers perform gravity defying jumps and tricks. The Ocean Watersport team are always at the ready to take advantage of these conditions when they arise, and kitesurfing is just one of a number of watersports activities on offer. Fully qualified instructors are available to provide tuition and internationally recognised sailing, windsurfing and kitesurfing courses for beginners and experienced guests alike. Of course, on those days where the wind doesn’t blow, and the sea transforms into a mirror, Ocean Watersport is a great place to go to for paddle boarding, water-skiing and snorkel safaris. Take a look at the video below to see just how much fun can be had with these incredible pieces of kit with the proper tuition!